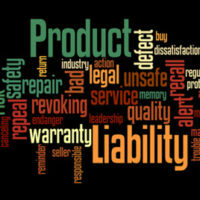 In late November, a number of new product liability cases were filed in Southeast Texas. The first was filed against Samsung Electronics America, Inc., claiming that a defective Smartphone exploded while the plaintiff was holding it; allegedly because the manufacturer failed to meet basic safety standards and did not provide a warning when they should have. The second involves legal action brought against LPM Manufacturing, Inc. and Leslie’s Poolmart, Inc. over one plaintiff allegedly suffering injuries from a bucket of chlorine tablets exploding while it was being stored. She is claiming that she not only lost her vision as a result of the explosion, but that she lost consciousness and suffered a number of orthopedic injuries as well. Design defect cases are difficult to prove in Texas because the plaintiff must not only prove that the defect was the cause of the injury, but that there was a safer alternative design available for the product, that “safer” design would have prevented or significantly reduced the risk of this same injury, and that design was also economically and technologically available and feasible to use at the time when the product was produced for and put on the market, which takes a significant amount of expert testimony. The expectations of every consumer. When it comes to product liability defense in cases like these, frequently, a common defense used involves the allegation that the plaintiff did not use the product correctly and, in doing so, caused their own injuries. Texas follows a Modified Comparative Fault Rule, meaning that the plaintiff cannot recover any damages from the defendant manufacturer if that plaintiff is found to be 51 percent or more responsible for the incident (i.e. their own injuries). In other words, the defendant is on the hook only if their fault is greater than 50 percent. Typically, whether or not product misuse was involved is an issue that is left up to a jury to decide. In addition, it is important to note that Texas juries have found that, even if a product was properly designed, sellers must in some cases provide warnings with respect to unknown dangers in the use of a given product. If you are a manufacturer facing product liability claims here in South Texas, you want to make sure that you have the very best in qualified representation. Our Brownsville product liability defense attorneys have that skills and experience to do what it takes to protect your company against claims like these. Contact us today at Colvin, Saenz, Rodriguez & Kennamer, L.L.P. to find out more.